This swing thought has you focusing on the back of the golf ball as you first address it, and throughout as you execute your swing. The back of the ball here refers to the half that is away from the target, or the half that is closest to your clubface. This is in contrast to looking at the ball in a general sense, or to look at the general area of where the ball lies. 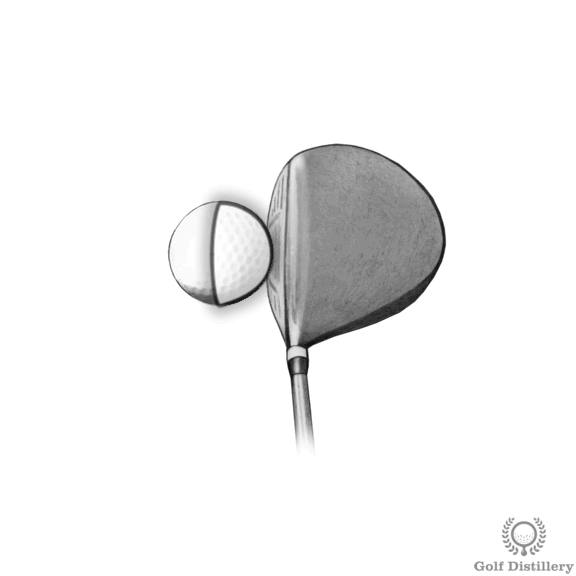 The swing key promotes intense focus on the ball by instructing golfers to not only be looking at the ball in a general sense but to pick a specific part on the ball – in this case the back half. By looking at the back half specifically, your body will be encouraged to hit at it while the club is rising, or in other words to hit up on it. It may also help you set up properly by encouraging you to drop the right shoulder to a level lower than the left, in order to account for your right hand being lower on the grip than the left. A natural tendency for a golfer is to look up as soon as contact is made with the ball. This tendency leads to golfers standing up at impact, or even worse to do so slightly before impact. By encourage you to focus on the ball, this swing key will encourage you to keep your upper body tilted down towards the ball instead of standing up, thereby promoting a more solid contact with the ball. In many cases, a golfer will have so many things to think about when performing a golf swing, e.g. correct grip, takeaway, swing path, etc. that he may forget to do something that is fundamental to the correct execution of said swing, and that is to actually look at the ball. So instead of staring at the ball in order to know exactly where it is on the ground, golfers oftentimes adopt a sort of blank gaze in that their eyes are trained on the ball but they are not really looking at the ball. Although some golf professionals recommend using this swing key for all sorts of shots, it is best used for drives and for shots made using a fairway wood. Indeed, for those the ball is meant to be positioned forward in your stance – which allows for a peek at the back of the ball. But crucially, those clubs are meant to hit the ball after reaching the low point of the swing arc as the club is rising from the ground, a process also known as hitting up on the ball. For shots using irons and wedges you may want to consider looking at the front half of the ball instead.